An ACT Government Land Development Agency owned development site in the heart of the Belconnen Town Centre on Canberra’s northside has been sold at auction by Ray White Commercial Canberra for $22.1 million. The approximately 16,314 sqm site known as Block 2 Section 200 Belconnen was sold to Canberra developer Geocon by Ray White Commercial Canberra Directors Andrew Smith and Doug O’Mara. Mr Smith said the site offered an exceptional englobo opportunity and the auction held at the Belconnen Arts Centre attracted 10 registered bidders. “There was massive interest in the site due to its significant size and location in the Belconnen Town Centre,” Mr Smith said. “The auction attracted spirited bidding and the site was sold under the hammer with Geocon the successful bidder. Mr O’Mara said the Land Development Agency allows the site to be used for multi-unit housing of not more than 745 dwellings. 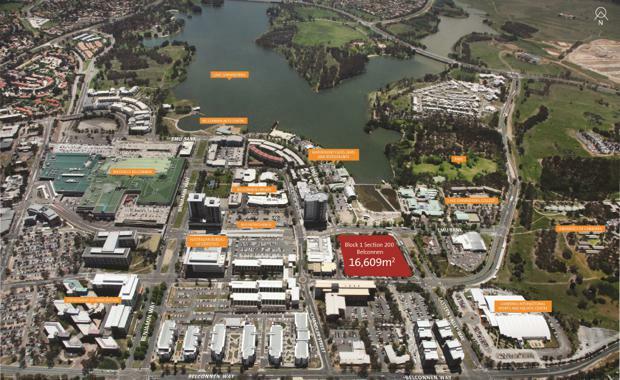 “Block 2 Section 200 Belconnen is located in the heart of the Belconnen Town Centre within close proximity to the Lake Ginninderra foreshore, the bus interchange, Westfield Shopping Centre and Lake Ginninderra College,” Mr O’Mara said. Ray White Commercial Head of Research Vanessa Rader said there had been record levels of investment in the Canberra multi-unit development site market this year. “This strong activity has been driven by local developers and is set to continue through the year,” Ms Rader said. Ms Rader said during 2015 to date there were sales in excess of $100 million which is expected to yield close to 2,000 apartments. She said since the beginning of 2014 more than $300 million has been transacted by the ACT Government Land Development Agency.